Julian’s latest exhibition, REGATTA 139, can be see at Seaview Hotel from 25th October. Regatta 139, is the new exhibition by acclaimed Island photographer Julian Winslow. Depicting the joyful side of friendly rivalry at the annual Seaview Village Regatta, it also highlights the powerful forces of family bonds, inner strength and community. “I approached the regatta from a different viewpoint. There’s an image of a group of people getting ready to push their boat out to sea and its timeless quality struck me. A striking image of a beach race depicts the seconds before crossing the line. A range of emotions: determination, envy, happiness and anticipation are visible on the runner’s faces. In contrast a series of three diving images are shot in sharp focus and show that crystal moment of commitment and self-belief. “Julian’s photographs give a distinctive perspective of the Regatta, making you rethink the subject matter. Julian, an Island boy, says he likes to see and discover the best in others, attended Medina High School before working alongside experimental gardeners, Chris Kidd and Simon Goodenough, at Ventnor Botanic Garden. There he developed a passion for photography, documenting the extraordinary and alluring world of plants. Julian has now been a commercial photographer for some 12 years and his commissions have taken him around the world, taking portraits of celebrities, rock stars and royalty. This summer he won the ‘Self’ competition at the Quay Arts. 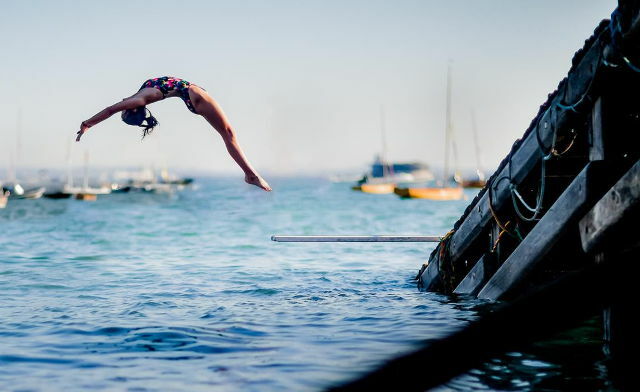 1 Comment on "Don’t miss latest exhibition by acclaimed photographer Julian Winslow"
Great picture of Lois Johnson winning the Seaview Regatta diving competition 2014 – it’s a really fantastic shot.